Elenore and Jack first got to know Noorlander Organs and the Hauptwerk technique on the Music China Fair in Shanghai, 2016. At the exhibition they played the organ with the headphones on because of the noise. The sound was extremely beautiful and they had never heard something like it before. After the exhibition they went to the showroom of Crescendo Virtual Pipe Organs several times. There they heard the sound from the organ itself and it was even more magnificent than that from a headphone. The Noorlander organ left them deeply impressed because of the 1) fabulous sound, 2) perfect touch of the keyboard, which is much better than the other brands that they played that day, 3) all the advantages that Hauptwerk’s virtual technique provides. It feels very nice to play organs from different churches, you can even hear the echoes from the bellows when initiating a sample set, it feels REAL. There are nearly 20 types of temperaments to choose from. Temperament means much in period music performance. A traditional digital organ is not likely to do that. The Noorlander organ is a present for Jack and Elenore’s marriage. The Sonnette III marked the new stage of their lives, being the witness of their tacit understanding. In China, spending a lot of money to buy a ‘rare’ instrument for your marriage is unusual. Usually people use this money to buy a car or decorate their new house. But they took a Noorlander organ as the best decoration ever: it makes life poetic. Noorlander has changed Jack a lot. He majored piano playing at university. After graduation, however, he had been somewhat fed up with the piano, but he didn’t know what else he could do. Playing the organ led him to a new way. 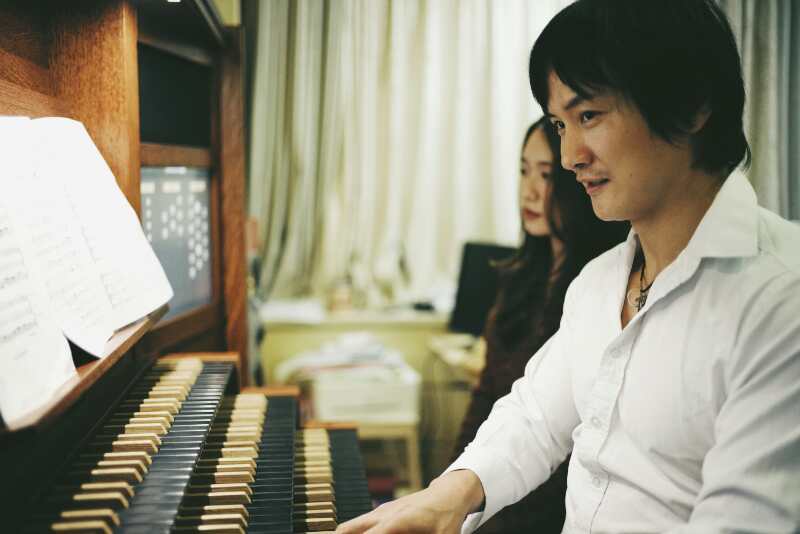 Now he practices 6 to 8 hours each day and hopes to study organ playing abroad someday. Elenore is a doctoral student of musicology. Because of Noorlander she has gradually engaged in organ music and sacred music research, which she never expected. What’s more, she gained a lot of knowledge of early music with the help of the different temperaments on the organ.